Project Description The 62,300 square-foot building features six faculty offices within two faculty suites, office space for over 100 postdoctoral and graduate students, classrooms, faculty conference rooms, multiple interactive lounge areas, and a central recycling room. The laboratory accommodates research groups in synthetic chemistry and chemical engineering. This project was a complete build-out of a new research laboratory with cleanroom, lab fume hoods, controls and process gases. Environmental The Schlinger Laboratory for Chemistry and Chemical Engineering features a “green,” eco-conscious design, furthering Caltech’s campus-wide sustainable commitment. The Schlinger Laboratory contains energy-conscious equipment and lighting, for a 28% reduction in energy usage and an impressive 30% reduction in water usage. The building earned a LEED Gold certification. Research areas were custom designed to meet the distinct specifications of the resident professors. 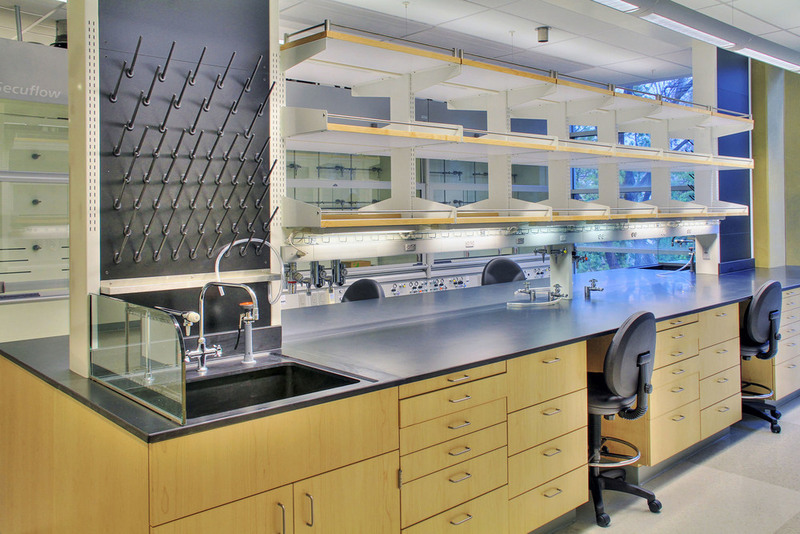 The laboratory also offers an abundance of ventilated chemical fume hoods, providing a high ratio of workstations per student or researcher.